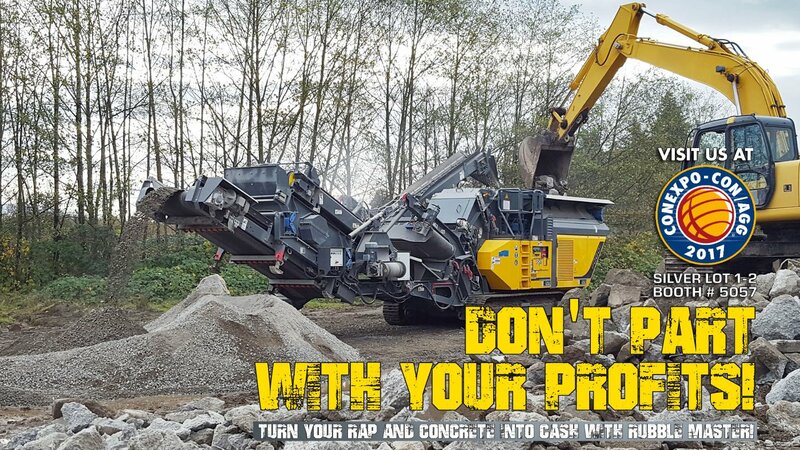 Turn your RAP and Concrete into CASH with RUBBLE MASTER! – Do you feel like hauling off concrete curbs, footing, slabs and asphalt paving from jobsites has become a costly exercise? – Are your dump fees for concrete and asphalt going through the roof? – Do prices for recycled aggregate keep on going up? Are you still in a position to deny a successful crushing & recycling program? Recycling is not just for the large contractor. Discover how RUBBLE MASTER’s crushing, recycling & screening solutions can give you a competitive edge and increase your profitability. Most of our customer base are small to medium size contractors who have a successful recycling program in place. RUBBLE MASTER believes you should have the opportunity to learn why onsite crushing & recycling is a necessity to make your bidding more competitive. Not everyone has that ability, but RUBBLE MASTER does – talk to other successful contractors who’ve implemented onsite crushing & recycling to become more profitable! RUBBLE MASTER is passionate about your success! Come and visit us at Conexpo – Silver Lots 1 & 2, booth #5057!